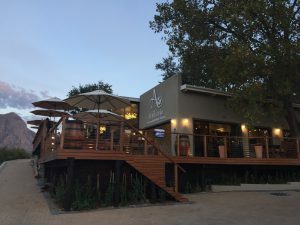 I was invited by a friend to a dinner at the Alluvia Boutique Cellar near Stellenbosch. 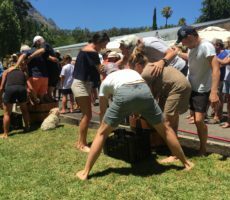 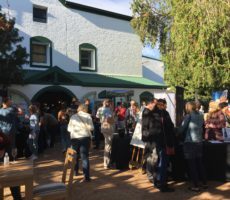 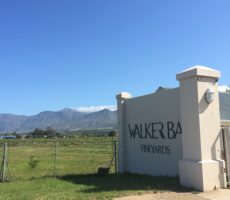 I knew little about the event beforehand save that Alluvia is located on the R310 Helshoogte Road between Tokara/Thelema and Le Pommier wine farms to the East of the City. 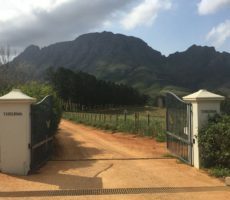 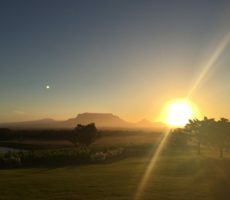 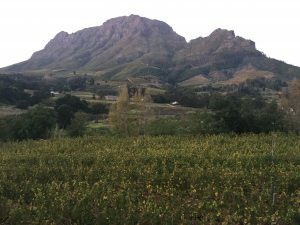 The invite was 6.30pm for 7.00pm and I arrived as the sun was setting over the lower Banhoek Valley and surrounding mountains. 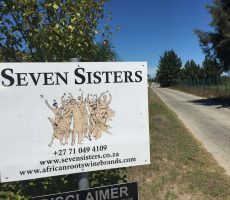 Alluvia claims it to be the ‘most photographed vineyard in Africa’ though I do not know on which basis. 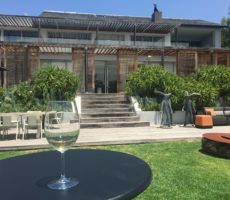 Several guests were already present when I arrived for a welcome glass of Rosé. 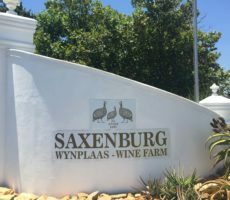 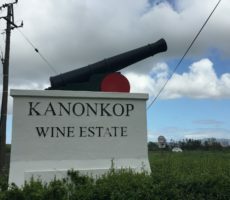 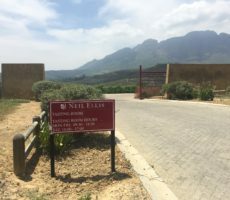 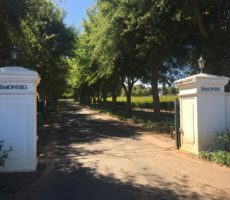 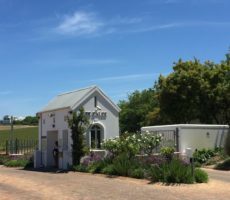 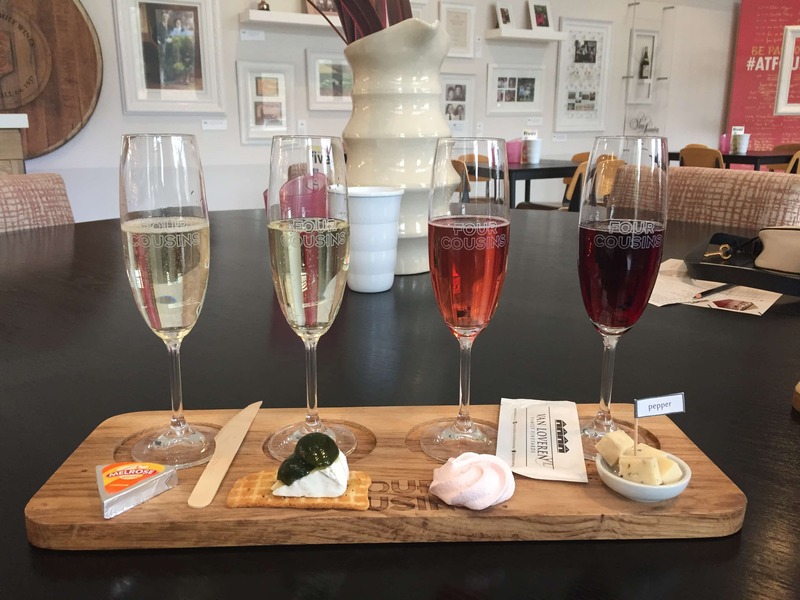 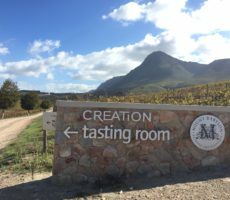 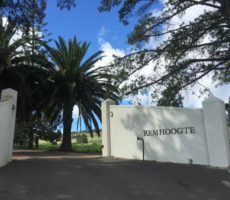 The wine was a Blanc de Noir made from Pinotage, yet to be labelled as of 2019 vintage. 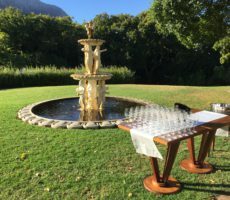 The other guests seemed mostly well known to each other and jackets and handbags were already laid on chairs to reserve places on one of the 4 long tables. 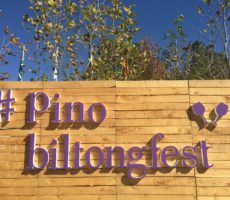 I soon saw Bjorn van Oort who I know from the excellent Pinotage & Biltong and Cabernet Franc festivals. 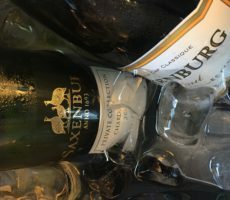 I then realised that the evening was one of the monthly Goblets & Gourmets Wine Club dinners. 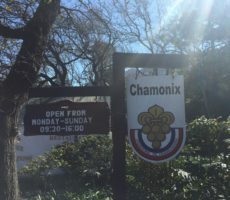 I had not been to one before so it was interesting to attend. 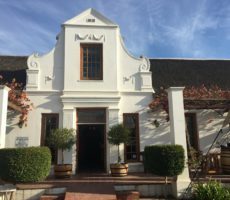 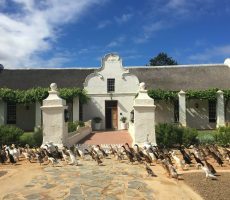 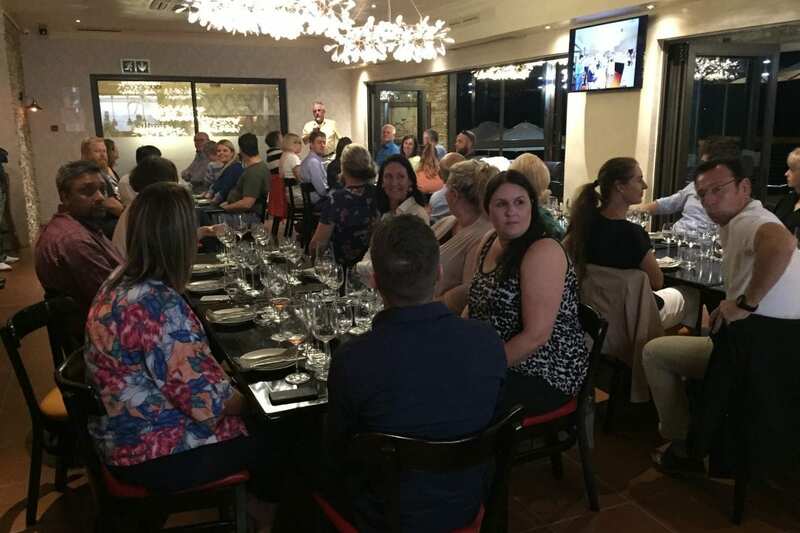 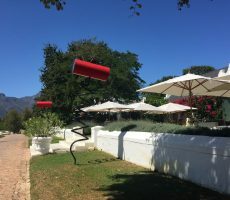 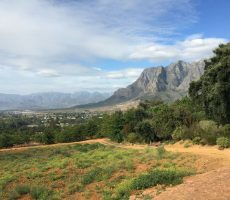 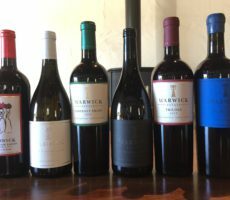 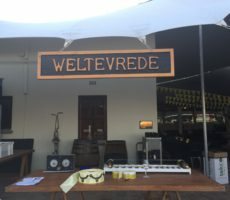 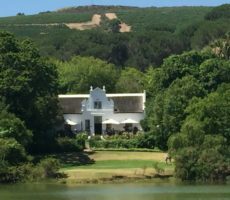 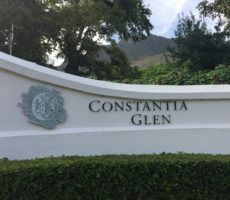 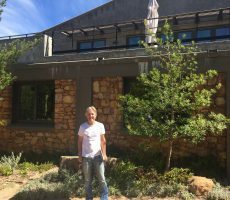 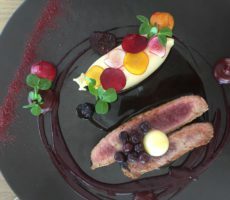 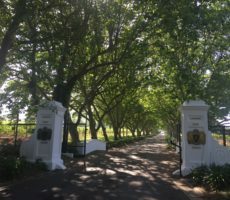 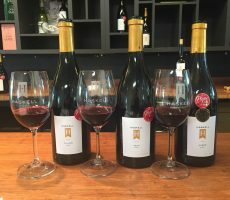 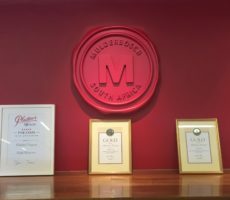 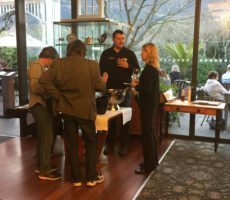 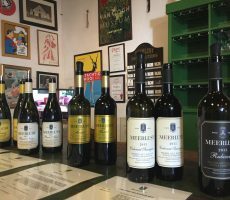 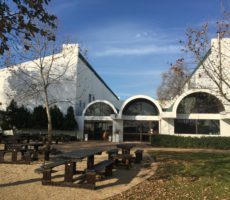 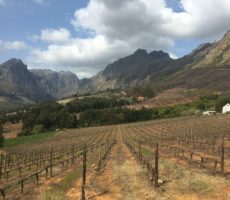 Goblets & Gourmets is one of 4 regional wine clubs that Bjorn runs, meeting on the 2nd Tuesday of each month at different wine estates in the Cape Winelands. 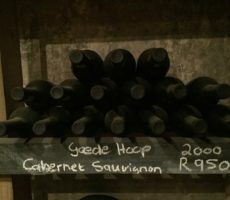 It was started in 1998 and the oldest of all. 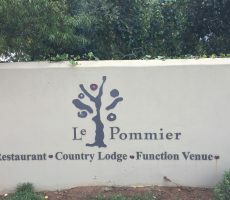 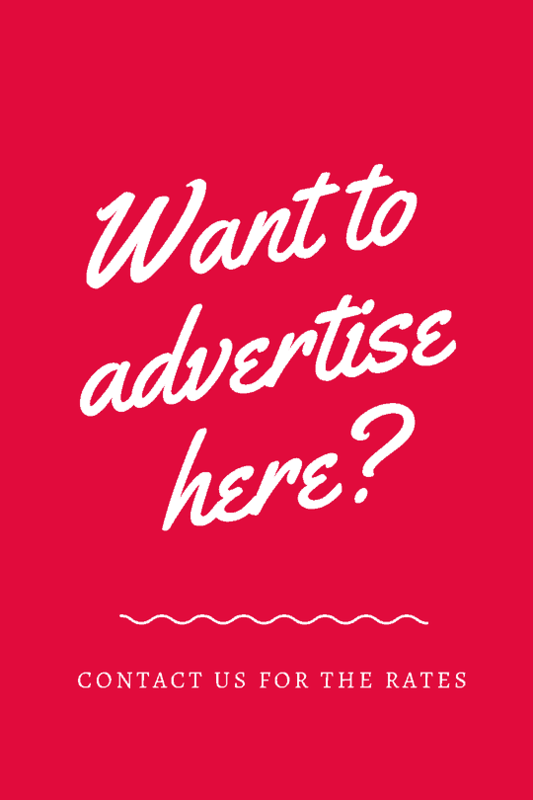 There is an annual member fee of R350, with dinners costing between R280 and R350. 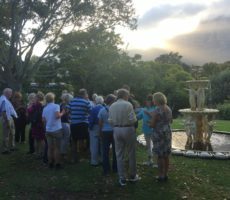 Some 40 guests attended. 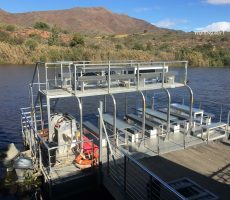 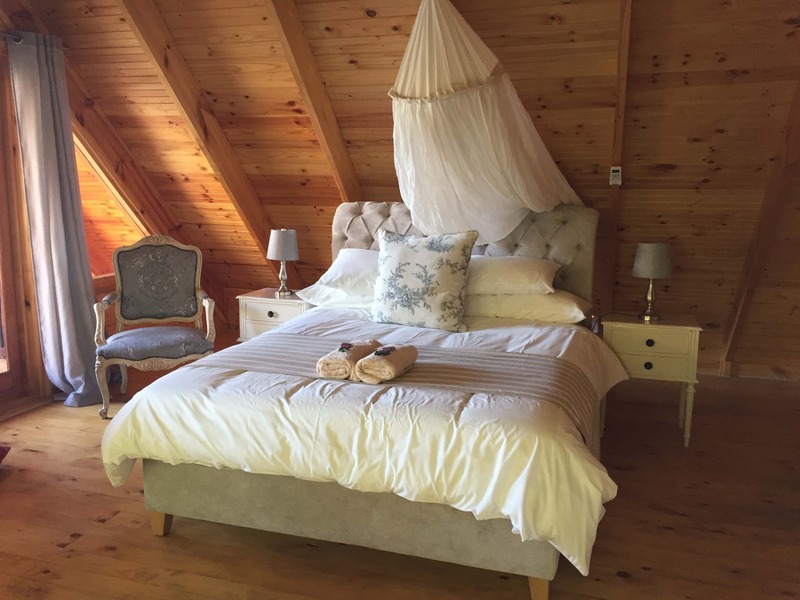 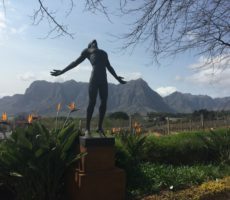 Alluvia, like the Clouds Wine & Guest Estate close to Delaire Graff on the opposite side of the Helshoogte Pass, offers luxury, boutique accommodation and spa facilities. 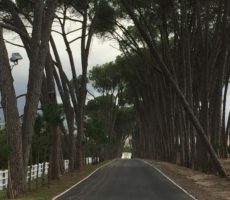 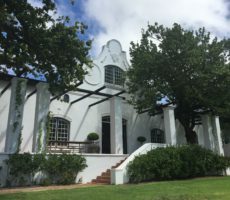 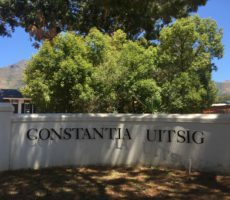 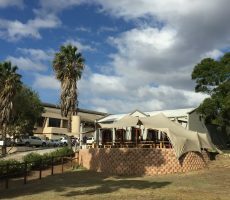 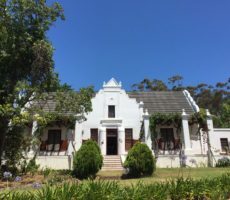 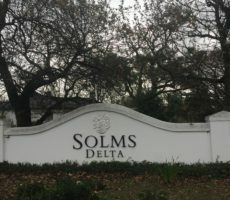 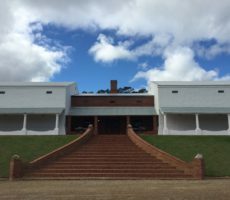 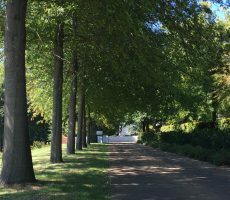 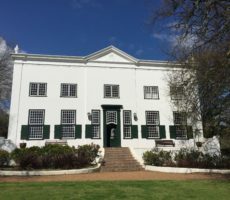 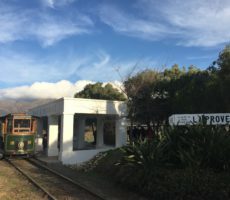 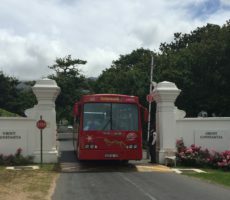 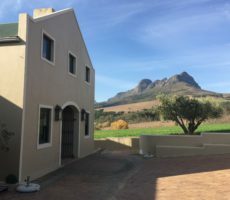 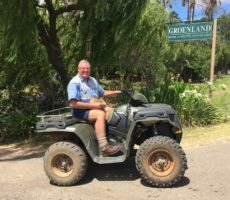 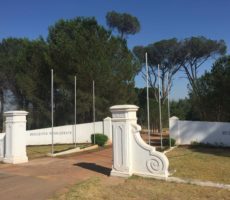 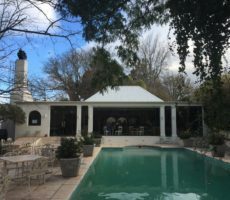 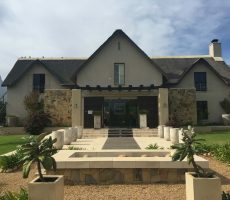 The property has origins dating back to the 1930s and a chequered history of ownership until the property was bought in 2002 by the Brugman family. 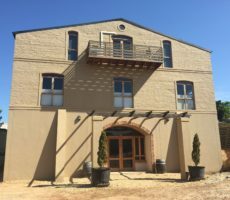 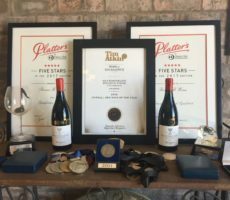 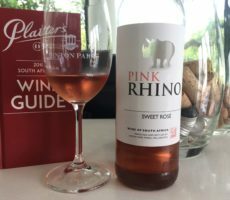 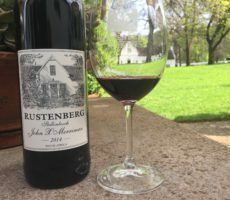 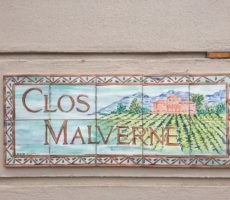 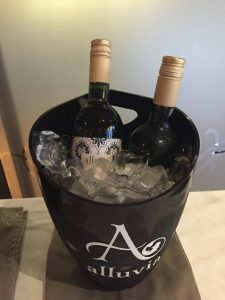 You will not find Alluvia listed in the 2019 Platter’s Wine Guide. 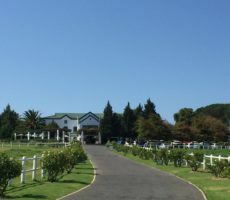 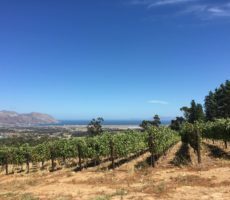 The wine farm is at 600 metres above sea level and known for Cabernet Sauvignon. 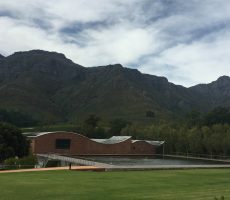 The name ‘alluvia’ is derived from the fertile alluvial soils that overlay granite and sandstone of the surrounding mountains. 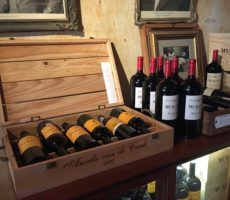 We were soon ushered into the Dining Room. 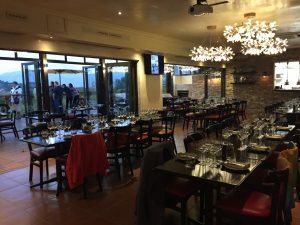 Bjorn explained that it was the first dinner at Alluvia. 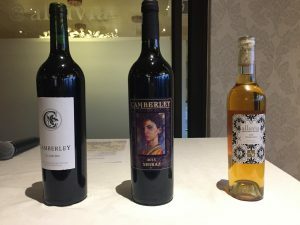 The estate produces few wines and so those from Camberley, also a boutique winery, were included for tasting. 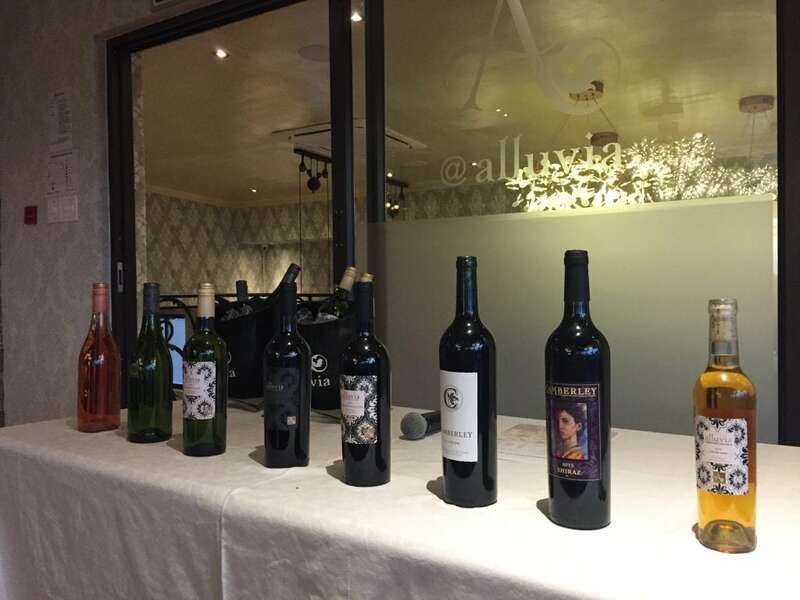 I did not know the function format but we began with a tasting of the wines from the 2 farms. 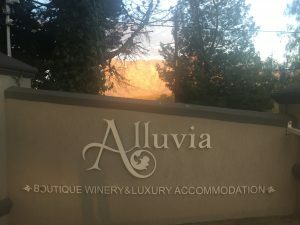 Alas, and rather inexplicably, the Alluvia owner/winemaker was not available to talk about the wines. 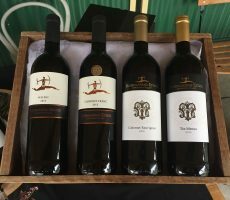 A Camberley representative was left to pick up the pieces but his knowledge, including those of the Camberley wines, was poor. 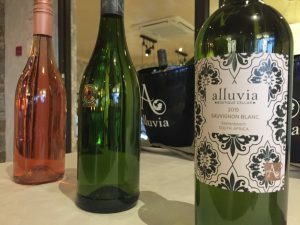 It made adequately rating the wines difficult but I nevertheless did not consider the Alluvia wines to be above average. 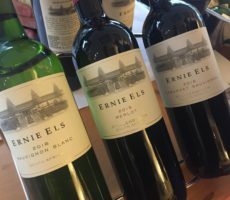 The best wines were the green styled Cabernet Franc and the sweet, dried fruity Straw Wine. 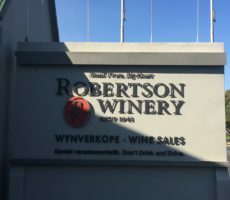 Bjorn encouraged us to score each wine after tasting using the 20 point scale – ‘3 for appearance, 7 for nose and 10 for palate, or whatever you wish’ – after which there was a show of hands for a consensus score. 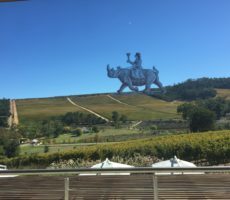 The mix of 2 wine estates and lack of clarity of vintage and information made it all rather confusing me for as hunger beckoned. 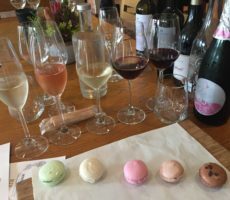 It did not help assess and appreciate the wines that the glasses were musty (perhaps fresh out of a box) and that the kitchen smells wafted across the dining area. 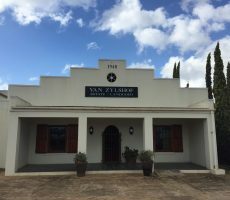 The 3 course meal consisted of mussels, lamb neck with vegetables, and malva pudding with vanilla ice cream. 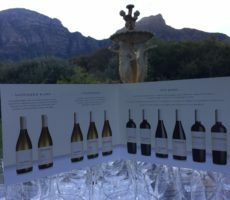 By now, the wines were long cleared with the expectation that guests would buy a bottle to go with their food. 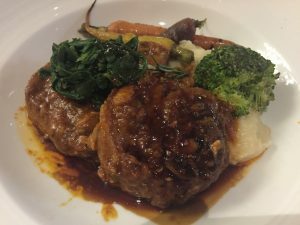 I may have been spoiled recently by the restaurants I have been to but the quality of the food frankly was poor. 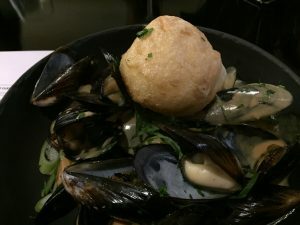 The mussels were chewy, the lamb neck scraggy and with little meat, and the dessert plain. 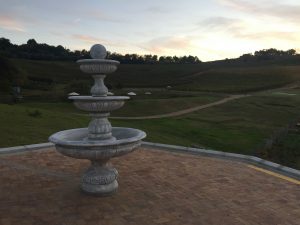 My host and I left after we had finished our dessert. 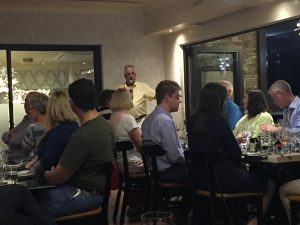 I did not enjoy the evening as much as the regular Wine Club members obviously did. 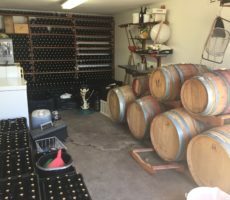 I felt very much like a square peg in a round hole. 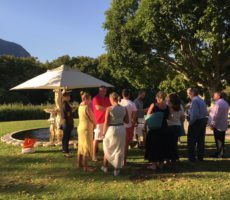 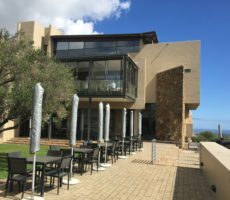 I realised as I left exactly why I established the Cape Wine Lovers’ Society rather than join a Wine Club or meet to taste at wine estates. 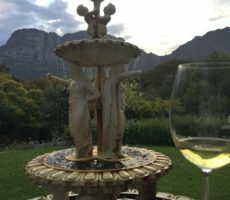 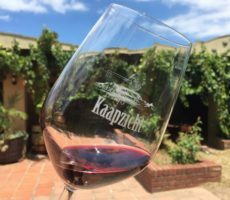 I value the independence I have of any wine farm, producer or retailer which allows me to host events with the wines I know and like. 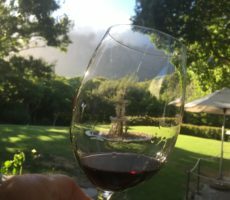 Moreover, a meal with wine – rather than wine with a meal – is an expensive format for me. 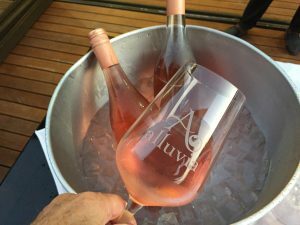 I was surprised too with how little knowledge was offered about Alluvia and its wines. 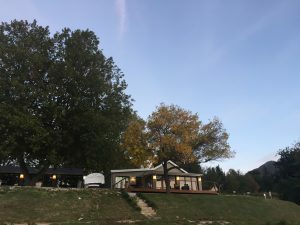 Bjorn is a genial man and a perfect host for the event but should have been able to fill in the gaps more than he did. 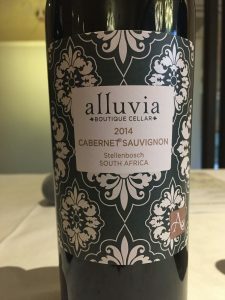 He, for example, told that the Straw Wine was made by neighbouring Zorgvliet and did not know the cultivar but when I tracked down a bottle it had the Alluvia label. 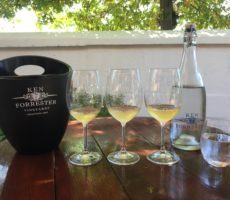 A google search under the table by my friend confirmed it to be made from Chenin Blanc. 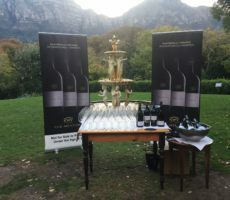 It may well be that the Wine Club member is not too interested in the wines and seeking a social evening with friends. 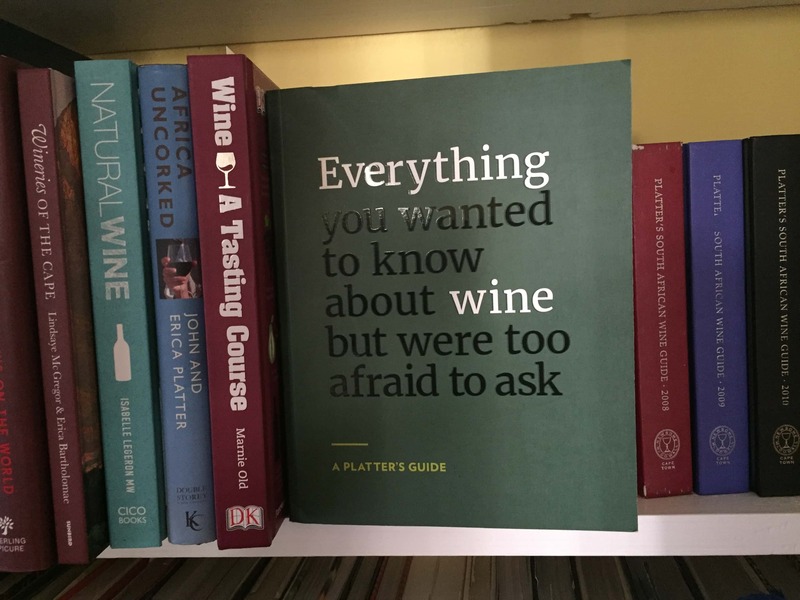 There is nothing wrong with that. 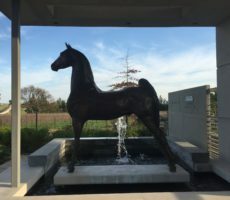 It is just not what I seek or desire.